Happy EYF weekend everyone, and say hello to Mabel’s Sister! This week we are launching the newest pattern at Loop, Mabel’s Sister, at Edinburgh Yarn Festival. We also have the printed pattern in our London shop, and online. This gorgeous cardigan has been designed by Fiona Alice, a former Loopette, especially for us. Fiona also designed our Mabel Cardigan, a sweet little baby cardigan. With the release of Mabel’s Sister, you’ll be able to match with your little ones! Fiona knitted Mabel’s Sister in Viola Organic Merino DK, in the colours Magnolia and Garden Ghost. This yarn is expertly dyed by Emily Foden, of Viola, and has the most wonderful subtle shading and beautiful speckles. 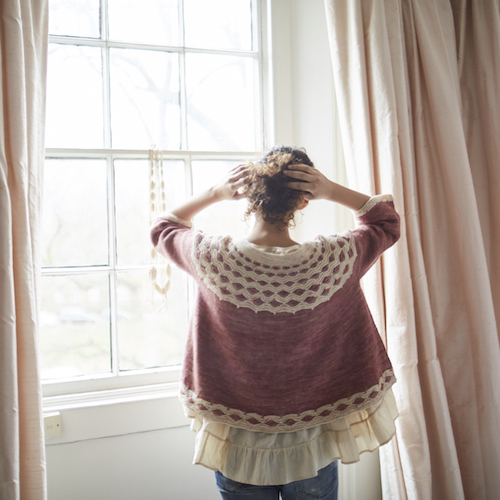 It’s super soft and drapes like a dream, and the base is completely organic! Welcome to Loop, Mabel’s Sister! Our wonderful Tuli Cowl was also designed for us by Fiona. This project uses The Uncommon Thread BFL Singles, and the Snail Yarn Gradient Bundles. The Snail Yarn bundles will be with us on our stand, and we will have two colours that are exclusive to Loop! We will also have the pattern for Tuli on the stand. 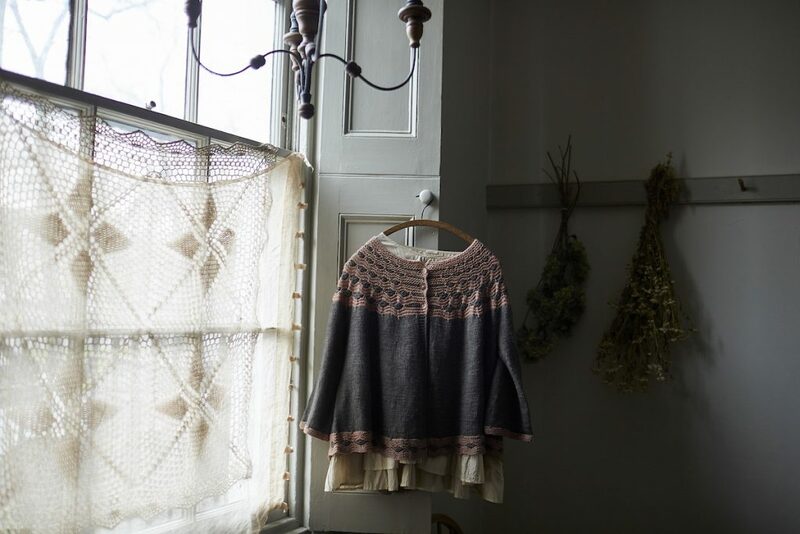 Fiona also designed our beautiful Sintra Cardigan – we’ve just restocked our copies of this one! Mabel’s Sister will be exclusively available as a kit on our stand, H1, at Edinburgh Yarn Festival this weekend. We will have a limited number of these, so make sure to pay us a visit. The PDF pattern for Mabel’s Sister will be available from 29th March, through Fiona’s Ravelry page. 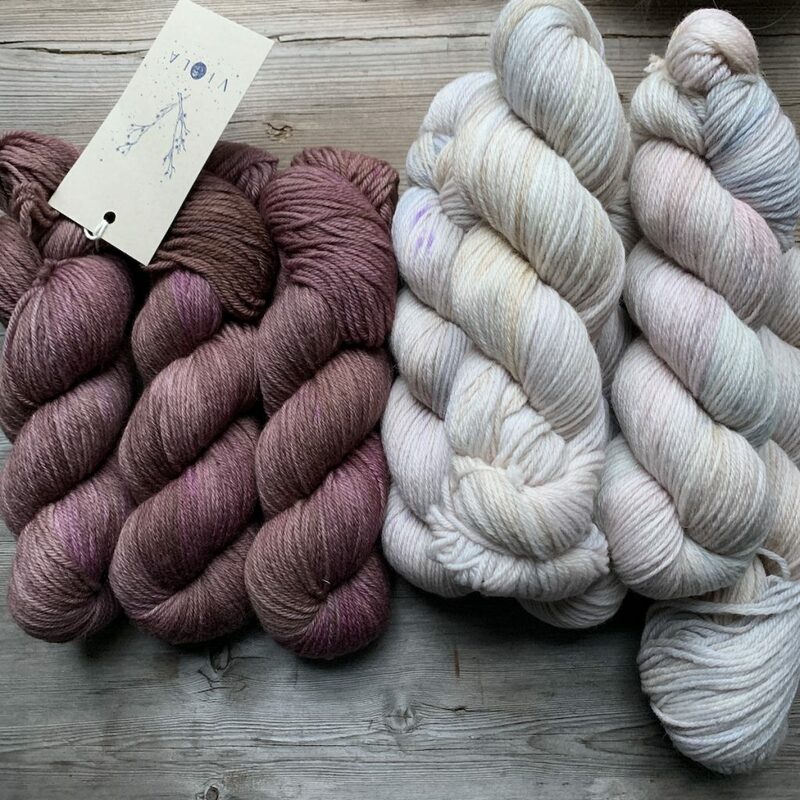 We have the kit in two colour ways; Magnolia with Garden Ghost, as the sample shows, and Silver Birch with Bronte, for a more muted version of our new cardigan. The kits include a copy of the printed pattern, as well as a special ‘Loop in Edinburgh‘ tote bag, that we had made especially for EYF! Emily and Fiona will both be on our stand over the weekend, so if you swing by you’ll be able to chat to them about this beautiful new kit. Emily will be on our stand on Friday from 2pm to 3pm, and on Saturday from 11am to 12pm. Fiona will be paying us a visit on Friday, from 2:30pm to 3:30pm. Here you can really see the beauty of the Viola yarn – what a beautiful speckle! Just look at this yolk! We will have the sample for Mabel’s Sister on our stand too; you’ll be able to try it on and get a feel for the yarn and how it will handle and wear (very beautifully in our opinion!). 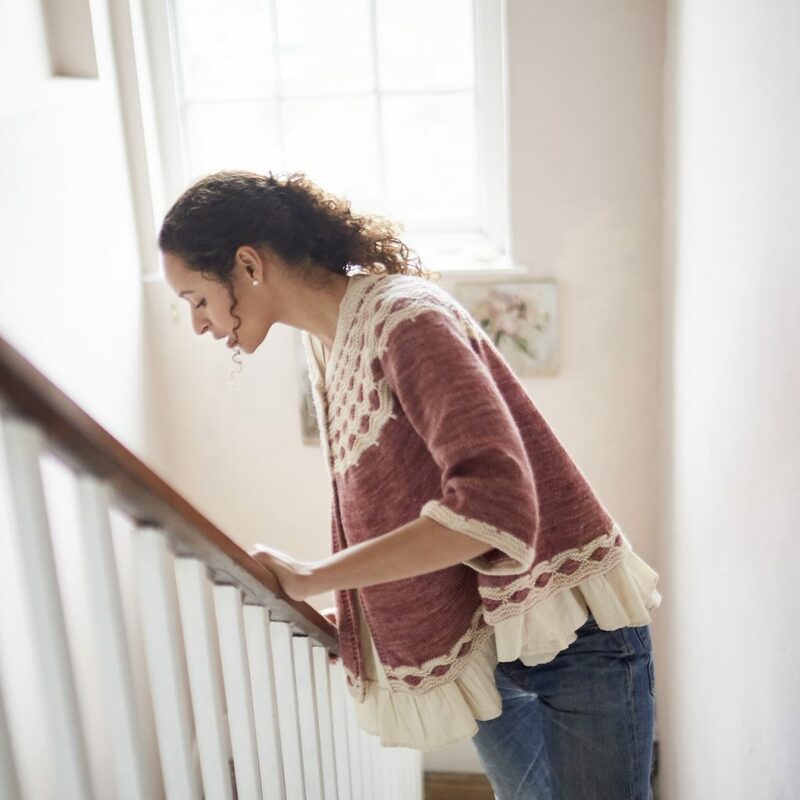 The pattern is designed in six different sizes. Our model Laeticia is wearing a size 3, with 14 inches (or 35.5cm) positive ease. It’s very oversized on her, but this cardigan is intended to be worn with 8-14 inches of positive ease, to produce and cosy and comfy garment. If you’re not able to make it to EYF this year, don’t worry! We know that not everyone is able to make the trip to Edinburgh. There is a very limited amount of the Viola Organic Merino DK in the shop at Loop at the moment, and is available to buy online too. The pattern for Mabel’s Sister is also available on our website and in store. We have more kits launching in early April, using Eden Cottage Bowland DK, with three new colour combinations. Victoria of Eden Cottage is dyeing the yarn for us at the moment! These will be available in our London shop as well as online. If you would like to be notified about the next release of our Mabel’s Sister kit, please send an email to shop@loopknitting.com and we will be able to add you to our waiting list. Loop will be at stand H1 at Edinburgh Yarn Festival. We recently wrote about what we have on our stand, and when our special guests will be visiting us. Have a read to find out everything you’ll need to know for planning your weekend! Photographs by Kristen Peres and Susan Cropper. ‹ Our Edinburgh Guests – book signings, kits and launches! Love the colours of the sock yarns this morning. I enjoy your posts,signed up for your blog. The most beautiful yarns at this store I have ever seen….sure would love to win this bundle from London…never been but to London but sure hope to in the near future just to so I can visit this store.